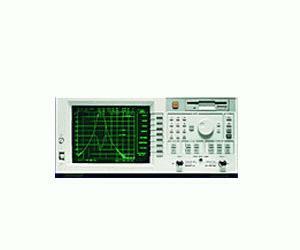 The Agilent 8712ET features a built-in transmission/reflection test set with a full range of magnitude and phase measurements. Two independent channels can measure and display two device parameters, such as transmission and reflection response, in a variety of formats including complex impedance, SWR, and delay, on rectangular, polar or Smith-chart displays. These analyzers also employ vector-error-correction techniques to enhance measurement accuracy.